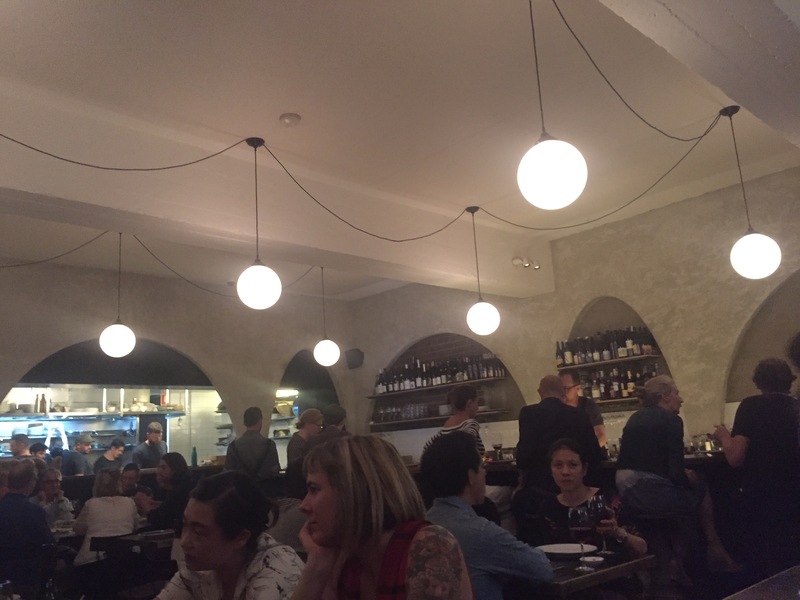 Ester Restaurant and Bar sits on Megher St in the trendy inner city suburb of Chippendale. The space is cosy featuring stunning hanging lights from the ceiling and large arches that frame the bar and open kitchen. When there’s a wood fire oven in the kitchen and bottles of freshly pickled veggies sitting on shelves behind the dining room you just know you are in for some good food. We arrive for dinner on early on a Tuesday night and the restaurant quickly fills up with a crowd of mostly young hip diners. Some sit up at the bar for a casual after work drink and bite to eat, others booking larger tables and filling them with an array of share plates and of course the tables for two – it’s a great place for a date! 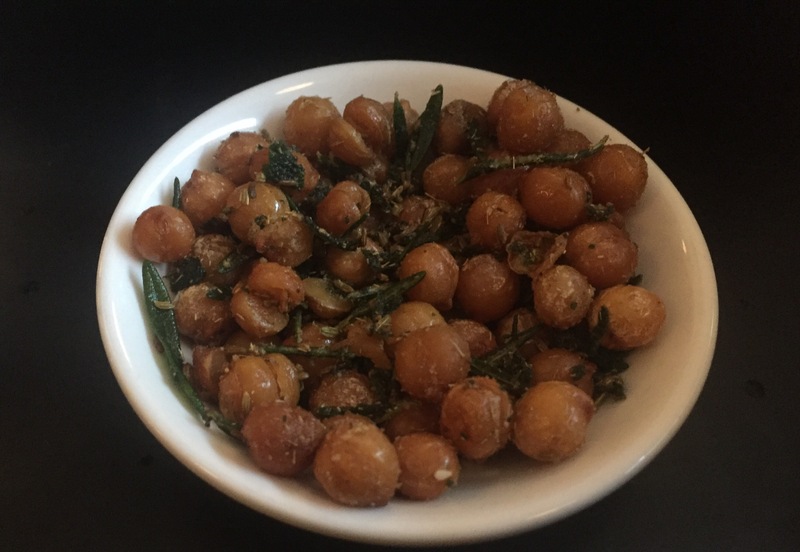 To start with at our table of two we indulge in a glass of Hure Freres, Pinot Meunier & Noir Chardonnay, Invitation Brut-NV, Ludes France ($24 a glass) whilst the waitress introduces the specials and sits down a bowl of salty deep fried chickpeas tossed with fresh rosemary. 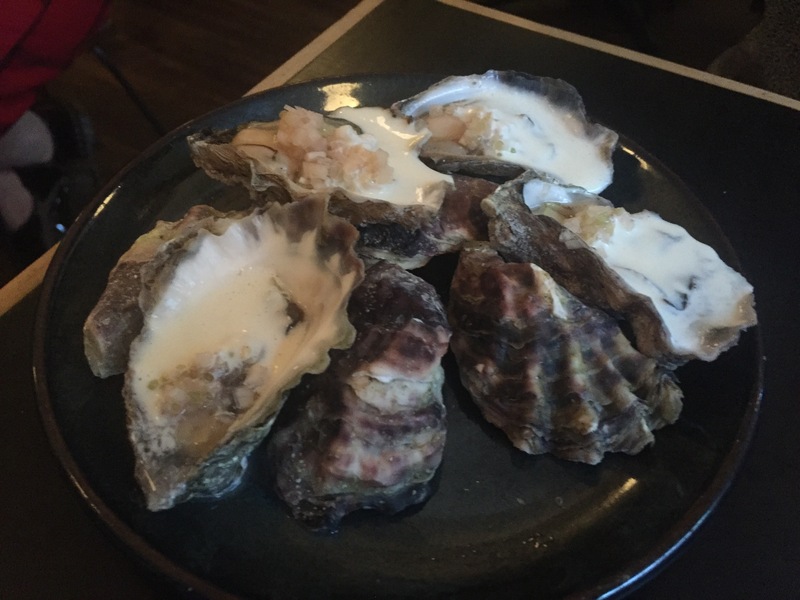 To accompany our glass of sparkling we start with some roasted oysters with horseradish emulsion ($5 ea) and a couple of slices of ester sourdough and cultured butter ($4 p.p). The oysters have just been roasted just long enough in the wood fire oven and the horseradish emulsion adds a hit of flavour which whets your appetite without being too overpowering. 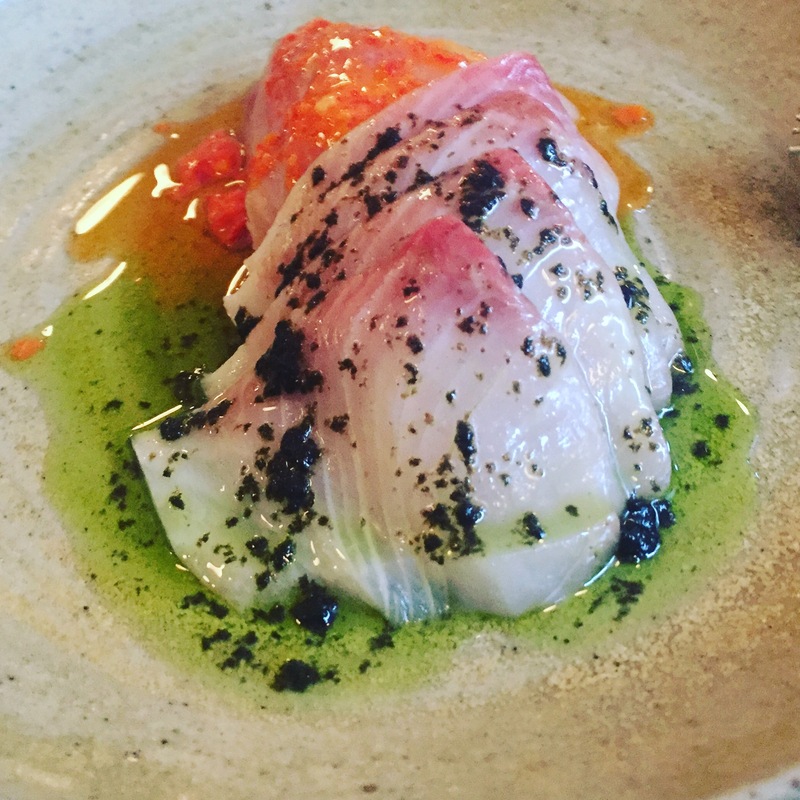 The raw kingfish ($22) at Ester is a very vibrant dish. With bursts of lovely bright colours splashed across the plate, the dish looks like a piece of artwork. The kingfish is served two ways. 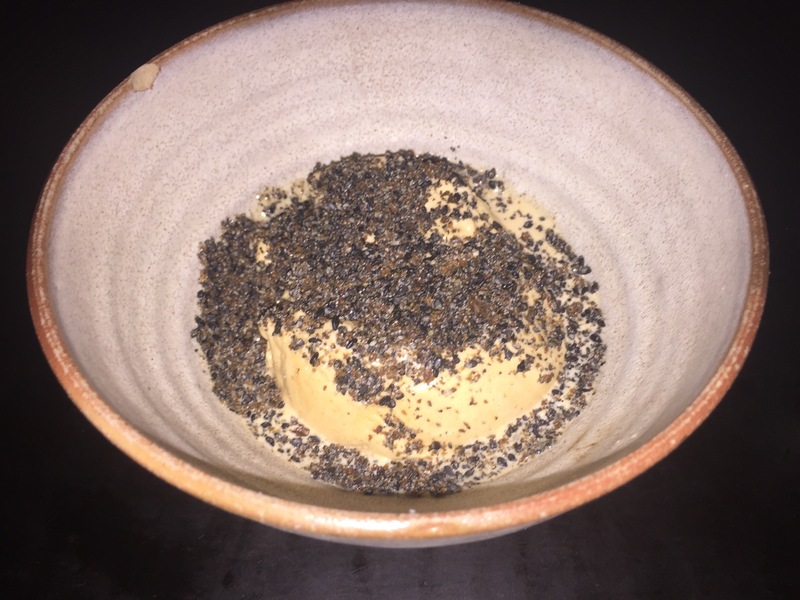 Sitting to the back of the plate is a bright orange mandarin koshu dressing full of beautiful citrus flavours. The slices at the front are dressed with a delicious Japanese nori dressing. Hiding underneath the kingfish are slices of pickled cucumber which I only discover midway through. The pickled cucumber compliments the fresh kingfish and each of the dressings perfectly. We order a bottle of Julien Meyer, Sylvaner Pinot Blanc, Nature ’15, Alsace France ($76). The extraordinary crisp and mineral white has subtle citrus notes that also pair wonderfully with the fresh kingfish. 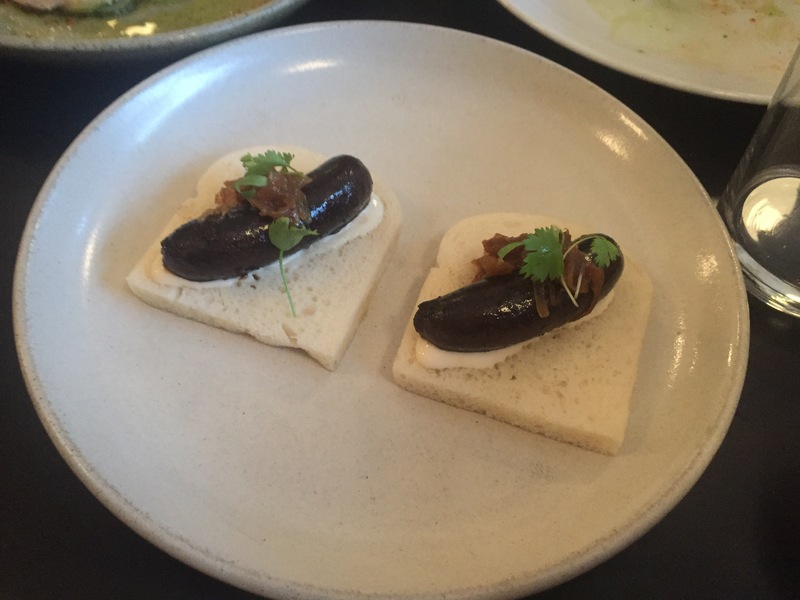 The blood sausage sanga is next up ($9 ea). I often find blood sausage to be quite intense in flavour. This blood sausage was quite subtle which I enjoyed. The bread was steamed and incredibly fluffy and the sandwich was topped with caramelised onions, a mustard aioli and fresh coriander. The large king prawns have been cooked in a fermented shrimp paste butter ($12) and they are delicious. 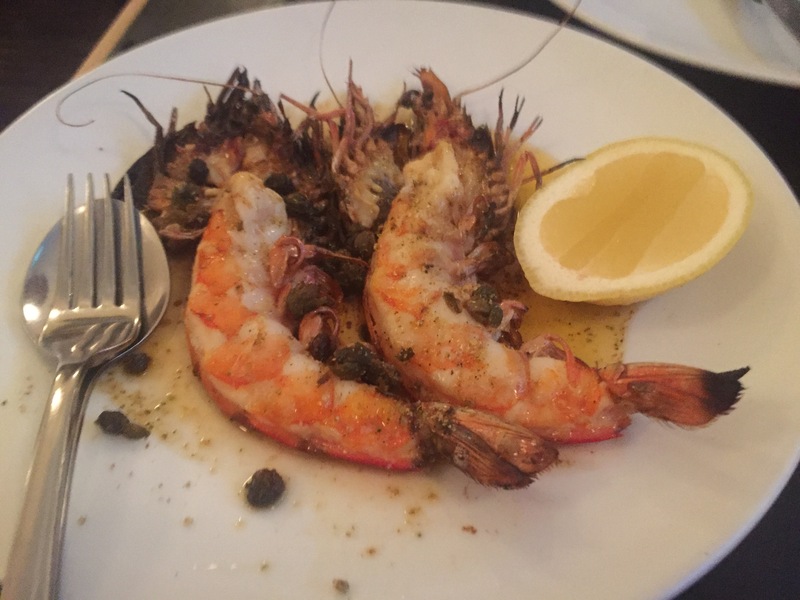 The capers on top add a lovely burst of saltiness to the strong prawn and shrimp flavours dominating the dish. Cooked to perfection, the oyster blade at Ester is tender and juicy ($42). Wrapped and roasted in wakame the meat was full of delicate salty and slightly sweet flavours. 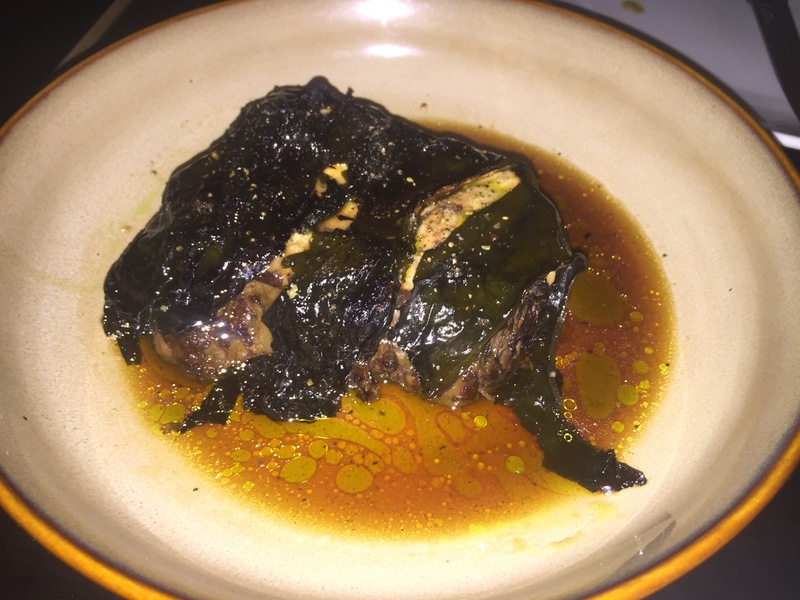 This is a standout dish with not a piece of meat or drop of sauce left on the plate. For dessert we share the leftover sourdough ice cream ($5). The ice cream is smooth and sweet with hints of butterscotch and caramel. The black crispy sourdough crumbs on top added a wonderful bitterness to the dessert. The leftover sourdough ice cream was a fantastic way to finish what was an incredible dinner. I will definitely be back at Ester to try more off the menu! Standout dishes – Raw kingfish ($22) and the oyster blade ($42). Positives – Cosy restaurant with a wood fire oven – perfect place to escape the cold Winter weather. Designed for sharing the menu features rustic, simple food with creative and sophisticated flavours combinations. Negatives – The food can come out quite quickly in early sitting. Look at booking the second sitting if a longer dinner is what you are after. Such a pretty plate of salmon carpaccio - the chilli, soy, sesame dressing on this was amazing!